Uncoated Business Cards is rated 4.6 out of 5 by 8. Rated 5 out of 5 by Scott from Fantastic! Excellent Print Quality and Color Match - I Couldn't be happier! Rated 5 out of 5 by Sewer Cleaning from Excellent! The business cards turned out perfect! We will be ordering more! Rated 5 out of 5 by libbypwva from Great Custom Order! I did a custom order of business cards for 8 of our veterinarians and they all came back to me and said they loved them! I've been using 48HourPrint for years because they make ordering easy and always provide quality products. They are definitely not the cheapest option, but I still prefer to use their services. When your business cards need to project a top-shelf image and you’re on a budget, you can count on great value at 48HourPrint.com. With our convenient online business card printing service, you get the benefit of high-quality printing at really affordable prices. Uncoated business cards provide the ultimate in versatility. 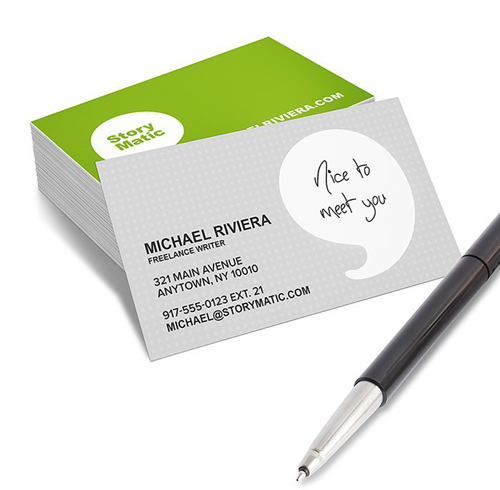 They combine the power of a business card with the option of adding messages by hand or inkjet printer. Uncoated business card printing delivers a classic look and multiple uses. Uncoated business cards can become appointment cards for a hair salon or medical office and provide the perfect surface for writing notes or adding a personal message. Also choose from one-sided or two-sided business card printing. Your design options are numerous! Learn how to use uncoated business cards as an effective marketing tool by checking out our business card marketing tips. Review our business card templates for layout guidelines that will help keep your print job on schedule.